Here at Latitude Group Travel, we know all too well that getting out of your comfort zone opens your eyes to a world of exciting and brilliant new possibilities. But before that amazing potential can be realised, you need to get there — and often it’s an awful long way there! But do you know what? Travelling overseas with kids may be a challenge, but it’s an adventure you can tackle with relish, too. You just need to know how. In this short guide, we’re going to run you through the basics of booking, packing, flying and arriving with kids on those complex, long-haul trips that (just quietly) are even tough for us travel experts and adults to cope with sometimes! Travelling with kids? Whether you’re a teacher travelling with students or a parent taking the kids overseas – follow these tips from our experts in educational world travel and enjoy the adventure! When you book that flight, don’t forget (if possible) to select food that your kids will actually like and eat. Airlines will have kids meals available but you can also bring along some of their favourite snacks. Hungry tummies and a long gap until the next meal do not equal fun! Also, don’t forget about any food allergies. If you want to get really smart, think about booking a flight that is close to your kids’ normal bedtime. With a bit of luck, they’ll be fast asleep for a big chunk of the voyage. Write (or help your kids write) a list of all the things they might need while they’re up in the air. The involves any medication, but also some toys and devices that might get them through the boredom. Downloading some of their favourite movies onto a tablet will help keep them calm. Top tip: Child headphones are an adult’s best friend when travelling overseas with kids! With that list written, let your kids do their own packing (and just double check they’ve got everything before you go). If they feel a true part of the packing process, they’ll also feel better about carrying around their bags! Here’s a gem of a tip: wrap up a little present and put it in your own carry-on luggage. If patience starts to run out mid-flight, tell them you have a special travel gift to give them! For bonus points, make it something they can use immediately. Make sure your kids are fully up to speed with their destination. By looking at a globe and talking about the excitement that lies ahead, long flights tend to go a lot faster for excited kids! Kids not used to planes can complain about their ears on take-off and landing. When this is happening, have a drink on standby for them to sip. It really helps! If you’re going to attempt a ‘stay in your seat’ rule for the entire flight, your kids are going to struggle through a long flight. So when the seatbelt light goes out, tell your kids they can (very respectfully) roam every now and then. Planes can cause anxiety in the calmest of adults – so imagine how some kids struggle to cope while in the air. So try your best to be the absolute image of zen – it’s an example your kids may want to emulate. Just like in-flight anxiety, even adults really struggle with jet-lag – so adjusting to a new time zone can be really tough on kids. So here’s a great tip: it’s easier to keep kids awake longer than they’re used to than trying to make them sleep at a weird time. Try to get out in the sunshine which helps your circadian rhythms (sleep-wake cycles) adjust to the new timezone. 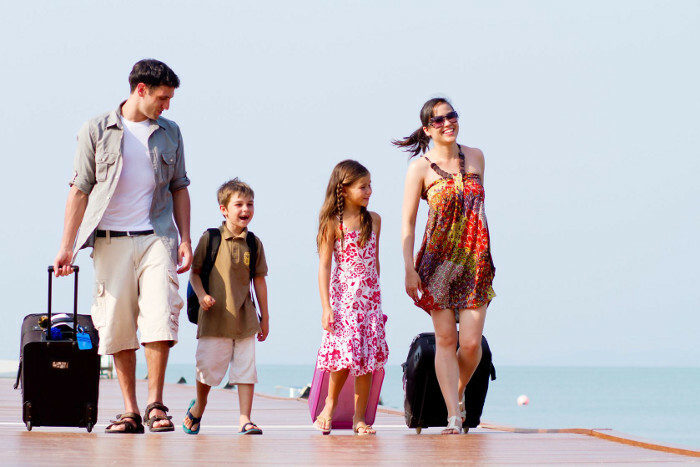 Ok, so this trip is costing a lot – but you’re travelling with kids, so don’t overload that itinerary. It’s ok to get busy with your trip at some point, but at least let your children adjust to the time-zone and get over the stress of a long-haul flight. Where possible, make travelling and flying with kids as fun as possible for the little ones. Consider giving them a travel diary, and their very own digital camera so they can feel empowered by documenting their own adventure. As an extension to tip #11, don’t be too hard on travelling kids! A lot of pre-trip excitement can eventually lead to a crash and burn meltdown of epic proportions. Just be ready for it and reassure yourself that travelling overseas with kids may be a challenge, but it’s really worth it in the end! Yes, travelling with kids can be a challenge. But yes, it’s also really going to be worth the effort of preparing well and executing the mission as expertly as possible. The reward will be an adventure of epic proportions and a stack of memories both you and your children will remember forever. Happy travels!